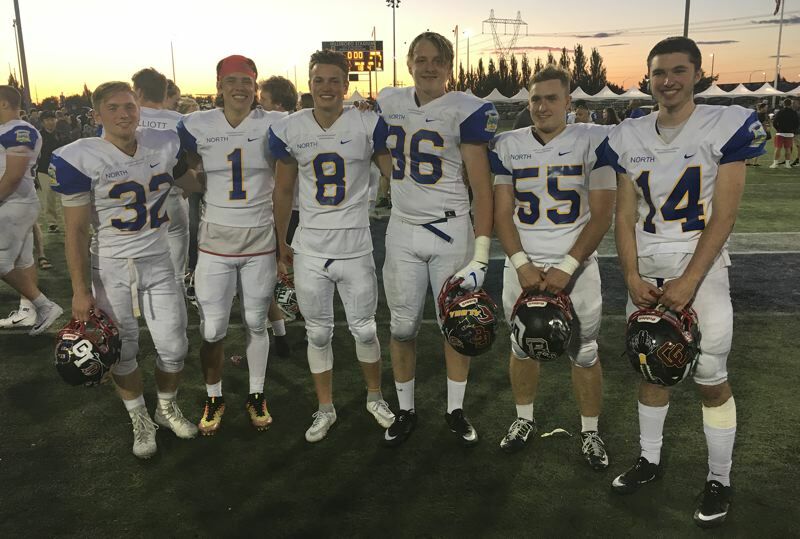 When the South team got the ball for the first time in Saturday night's Les Schwab Bowl and went 99 yards in 16 plays for a touchdown, it looked as if it might be a long night for the North defense. Then the North woke up. A goal-line stand on the South's second possession, plus Grant Ewell Jr.'s interception return for a touchdown and a safety just before halftime served as key turning points in the North's 24-7 victory in the 71st edition of the annual high school football all-star game at Hillsboro Stadium. "It was a good time," said North free safety Braelen Bettles -- one of six players representing Class 6A state champion Clackamas. "Our defense really held it down and not only kept us in the game, but won us the game, I would say." Clackamas quarterback Mitchell Modjeski delivered the final nail when he guided the North on a 15-play, 67-yard scoring drive, capped by an 18-yard touchdown pass to Gresham's Levi O'Connell that closed out the scoring with 5:05 to play in the fourth quarter. "I think we were a little hyped up at first and it took awhile to settle down," Modjeski said. "Once we did, we got it rolling, and our defense played great the whole game." The rest of the Clackamas contingent -- wide receiver Aric Bergers, offensive lineman Hudson Bishop, outside linebacker Perry Cosgriffe, and running back James Millspaugh -- also saw significant playing time, which should come as no surprise considering Cavaliers coach Joe Bushman was the one running the show on the North sideline. "It was cool getting to be with our guys one last time. That's special," Bushman said. "It was a workmanlike victory. It wasn't pretty at times, but we played good defense, especially from the second quarter on when I thought we dug in there really well. "I was really proud of them, and then we did just enough offensively there in the second half to pull away." The final statistics were a virtual toss-up with the South running 58 plays for 233 yards total offense to the North's 66 plays for 228 yards, but the game turned on three South turnovers -- two interceptions and a fumble on a punt return. The South also was called for 12 penalties for 114 yards, the North nine for 84 yards. Modjeski, who split time at quarterback with Grant's DeMarques Singleton, completed 10 of 16 passes for 111 yards and had nine carries of minus-1 yard. Millspaugh finished with a game-high 16 carries for 22 yards and also caught two passes for 11 yards as the North snapped a three-game losing streak in the series and regained a 34-33-4 series lead. "It was an all-around great week," said Millspaugh, who saw extended playing time after Sherwood's Zach Jenkins sustained a knee injury. "The team came together really well during all the different things we did, from bowling to the wing-eating contest to just hanging out in the dorms. "I think the team that came together the most was going to win the game, and I think we did that." Milwaukie inside linebacker Chazz Amundson also saw significant playing time on defense for the North and was a force in helping to stop the run as the South finished with 114 yards on 41 carries -- a 2.8-yard average per carry. "Man, it was an amazing experience," Amundson said. "Playing with all these good people give you some perspective, and then being able to win … you know, it's a great feeling being able to beat a bunch of all-stars, right? Bragging rights forever." The North took the opening kickoff and ran four plays that netted six yards before downing Hoyoung Sohn's 44-yard punt at the South 1-yard line. 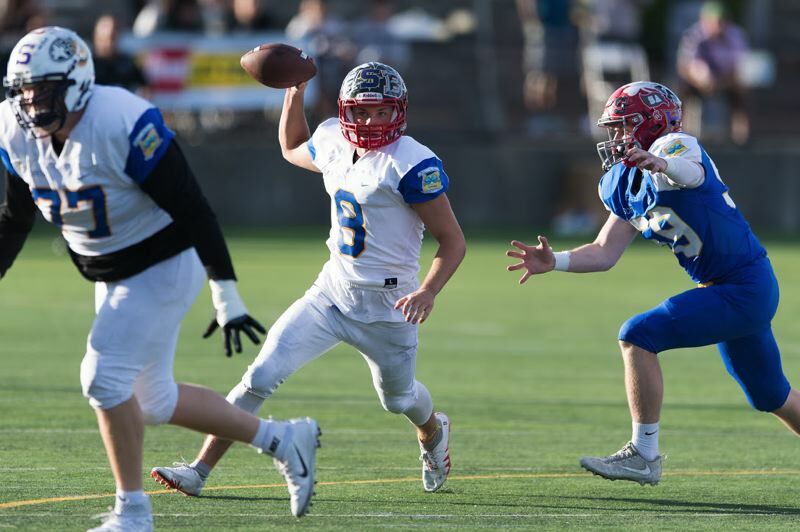 The South then marched the length on the field in 16 plays, capping the drive with a 9-yard touchdown pass from Robbie Patterson to Jaylin Parnell -- the same South Medford combo that gave Clackamas headaches in the 6A state championship final. On the ensuing kickoff, Jefferson's Romeo Akil fumbled and Willamette's Bryce Goggin recovered for the South at the North 8. Three consecutive run plays for Hermiston's Jonathan Hinkle gained six yards, setting up a fourth-and-goal play at the North 2 that saw Parnell dropped for a 1-yard loss by Amundson and Aloha linebacker Gage Holman. "We dug in and we got a stop, and we didn't realize it at the time, but that was really the turning point in the game, getting that stop," Bushman said. "If the South goes up 14-0, it might have been a different story now. "We were a little bit on our heels defensively to start the game, so we talked to our outside linebackers about bringing the fight to them, because they were running that power play that South Medford runs. Our outside linebackers weren't very big, but Taran Floyd (5-foot-10, 177 pounds from West Linn) and Grant Ewell (6-0, 180) stuck their noses in there and started to play physical." Ewell intercepted a pass from Pendleton's Nick Bower and returned it 71 yards for a touchdown, and then Modjeski passed to Ewell on the two-point conversion to give the North an 8-7 lead with 11:58 left in the second quarter. The South dug a deeper hole when Bower retreated to the end zone on a second-and-9 play at the South 9 and was called for intentional grounding, resulting in a safety that pushed the North lead to 10-7 with 46 seconds remaining in the half. After a scoreless third quarter, the South scored two fourth-quarter touchdowns, the first on a 13-yard run by Singleton at the end of four-play, 34-yard drive that was set up by another Ewell interception, and the second on the 18-yard Modjeski-to-O'Connell scoring strike. "It was definitely cool to end the game on that drive," Modjeski said. "It was one of our longer drives, but it was kind of what we had to do to put the game away at that time. So, it kind of worked out perfectly for us with the timing and everything else." When the teams gathered for the first time on Monday at Pacific University in Forest Grove to begin preparations for the annual showcase of the state's top 6A and 5A outgoing senior players, Bushman set two goals for his North squad. One was to have fun and develop new friendships. The other was to compete and play to win. "Mission accomplished," said Bushman, who had Clackamas' Hut Calhoun, Grant's Randy Heath, Sunset's Damien Merrick, Central Catholic's Steve Pyne, and Franklin's Wes Warren as assistants. "It feels great. To have only a week with a group of kids and try to bring them together and get them to play for each other is a challenge. "Our kids really bought into what I and the other coaches were preaching on playing as a 'team.' I think they did a really good job of that, and that was tested early on, but we didn't fold. We hung in there and turned things around from the second quarter on, so hats off to 'em." Said Modjeski: "The week was awesome. I mean, I'd say the week leading up to the game was better than the actual game, just meeting everyone on the team, being together, and actually bonding with them and creating what I think will be some lasting friendships. "When you get these many people together that all play football at a high level, you're all going to have stuff in common, and it's really cool to gel with people like that." Bettles, the Oregon State-bound defensive back, agreed that the week leading up to the game was an experience he won't soon forget. "It was fun to get to know players on other teams and create a bond that you never thought you'd have," Bettles said. "Going against a lot of these guys in league play, you think of them as your enemies. But coming together and seeing how cool these guys really are as people was a lot of fun." Bergers, the wide receiver who is heading to George Fox University in Newberg next fall, didn't catch a pass, but he got his number called just before the half on a flanker-pass play that didn't unfold as planned and turned into a run play that went for no gain. "Yeah, I was going to throw it," Bergers said. "I was supposed to have some protection to roll outside on that play, but the defensive end stepped up, so I moved up in the pocket and then the receiver I was going to throw it to didn't turn his head in time. I saw the cornerback drop as well, so I tucked the ball and tried to get what I could. "It was a fun week leading up to a fun game, and being around the guys and getting to know everybody was fun. If you don't get the ball thrown to you, it doesn't matter that much. It's all about having fun and we're on the winning team, so I don't have much to complain about." Cosgriffe, the Eastern Oregon University-bound defensive end, shared playing time with Lake Oswego's Shawn Elliott on defense and also saw a few snaps late in the game at tight end on offense. "It was awesome," Cosgriffe said. "At the beginning of the week, we were kind of awkward with each other. We didn't really know each other and then as we're going to different events and bonding as a team, we came together really well, I feel like." He also enjoyed seeing the defense step up the way it did after the South's initial scoring drive. "We just flipped things around," Cosgriffe said. "We figured we had to attack and be aggressive. That's what defense is all about. We adjusted some alignment things and found some different plays we could run and that really helped. "Our finish was a reflection of what we did the whole week -- how we practiced, how we came together as a team -- and I think it really showed with a good win. For Bishop, who split playing time with Sherwood's Nick Garrison at offensive right guard, it was a perfect ending to what was likely the final game of his playing career. "Honestly, it was a great experience, just the entire week," said Bishop, who plans to attend Oregon State to study business. "Coming in and not knowing anybody, and getting close with all these guys was great. I made some new friends and being able to make that bond in a game were all the best players from the North and South come out and compete together and play our best was a great experience overall. "It exceeded my expectations. And we're undefeated still, so it's a great feeling." RUSHING: North -- DeMarques Singleton 4-46; James Millspaugh 16-22; Korbin Williams 4-20; Zach Jenkins 4-9; Braelin Bettles 1-3; Nick Cizik 1-1; Aric Bergers 1-0; Mitchell Modjeski 9-(-1). South -- Jaylin Parnell 13-44; Jonathan Hinkle 10-43; Robbie Patterson 7-22; Tyson Hass 1-14; Nick Bower 10-(-9). PASSING: North -- Mitchell Modjeski 10-16-0-111; DeMarques Singleton 3-9-0-18. South -- Robbie Patterson 7-12-1-107; Nick Bower 3-5-1-12. RECEIVING: North -- Jordan Hill 4-31; Korbin Williams 3-26; Nick Cizik 2-34; James Millspaugh 2-11; Levi O'Connell 1-18; Jaydin Proctor 1-9. South -- Jaylin Parnell 4-38; Bryce Goggin 3-43; Jonathan Hinkle 2-4; Shaw Jerome 1-34. Linemen of the Game: Levi O'Connell, Gresham (North); Alex Sanchez, South Salem (South); Backs of the Game: DeMarcus Singleton, Grant (North); Jaylin Parnell, South Medford (South). Most Valuable Player of the Game: Grant Ewell, Jr., Grant (North).